The last few months I’ve been drafting a brand new book. It’s a paranormal murder mystery set on the British Columbia coast. 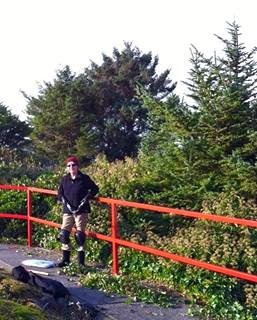 In 2013-2014, I worked as a Relief Lighthouse Keeper for a year with the Canadian Coast Guard. I kept a journal and blogged my adventures here. Last summer, I went back to the Nootka Lightstation by Yuquot on the western shore of Vancouver Island to refresh my memory and take more photographs. This is the setting for Ghost Light. Naturally, I’ve been digging into my old journals as I write and I came across this one. I’m so glad I took such detailed notes! Here, I explain a little of what lighthouse keepers do. Here’s where you can apply for a position as a Relief Keeper. When I say, I am a lighthouse keeper, most people are surprised. Unknowingly they smile. Do they still exist? How did you even think of doing that? Is there training? How did you get the job? I understand this fascination; asked many of the same questions myself, when my friend became a keeper a few years ago. Romantic. Captivating. The Lighthouse. That fiery beacon by the misty sea is ingrained in our ancestral memory. If you’ve ever dreamed of living in a tower, stirring up a cauldron of chowder, or sipping tea as you scan the horizon for floundering ships, you know what I mean. But be forewarned. As merry as it seems, lighthouse life is not a dream. When the online job posting appeared at last, I applied and waited, interviewed and waited; and finally, was informed that if I passed the medical, I would be accepted as a candidate. Assistant lightkeeper. Entry level position: relief. Much like a teacher-on-call, I would fill in for someone going on leave. Variable times. Various locations along the coast. Yes please. But, being a lighthouse keeper is demanding: physically, mentally, and emotionally. Because stations are in remote locales, you must be in good health. If you’re on any kind of medication, you must remember to bring plenty with you. There’s no slipping out to the 24 hour pharmacy. There are still twenty-seven staffed lighthouses on the B.C. coast, and each is unique. As a relief keeper, I travel between them, work with different Principal Keepers, and stay in different houses. Some are bungalows, some are two-storey, some are spare houses sparsely furnished; while others–especially if it’s a keeper’s residence—are cozy and comfortable. But, if you don’t like sleeping in different beds, this is not the job for you. Though we don’t live in the light towers, we do climb inside them. Someone has to clean those windows and make sure everything is functioning as it should. And we climb stairs, countless stairs, and cement steps, some ancient and uneven. We scramble up and down ramps, hike forested trails (whenever possible) and pick our way through rocks and boulders. It’s all hard on the hips and knees. I’m petite, so even getting in and out of the helicopter is a challenge for me. Dipping diesel fuel tanks from atop a ladder. Helping to refuel domestic tanks. Dipping cisterns. Rainwater collects in a 5,000 gallon cistern in the basement and is filtered for drinking. Filters also must be changed. Scraping and painting buildings, decks, and walkways. Testing the fire pump and hoses, and checking fire extinguishers. At one station, armed with trimmers and clippers, I battled English ivy, knowing full well that in weeks, it would be back, sucking the life out of every living thing in its path. Carving a space in the salal is a constant challenge. Still, wearing personal protective equipment, we maneouvre and maintain self-propelled lawnmowers–my personal bane–weed-whackers, hedge-clippers, tractors, and pressure-washers. We are coastal caretakers. Lifting. 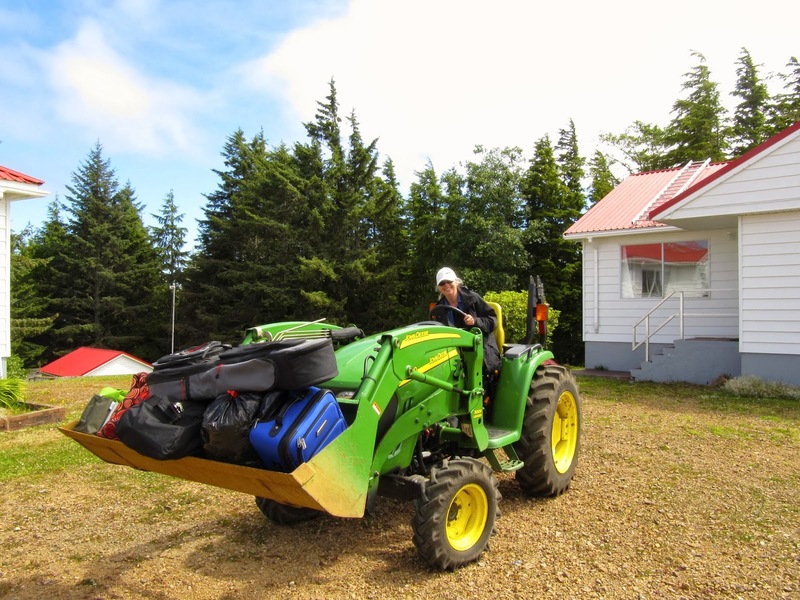 Besides packing in all of our own food–that’s a whole story in itself–when there is a grocery tender, lightkeepers unload boxes from the helicopter, deposit them in a trailer, and then carry them gleefully into the house. You should be able to lift about fifty pounds. When I fell at the beginning of August and sprained my back, I had to stay off work until I was healed sufficiently; in fact, I had to see a Coast Guard doctor before returning to the job. Not exactly sipping hot tea by the sea. So, what do I love about being a lightkeeper? The adventure. Lift off in the helicopter! And cruising up the coast like a dragonfly. Watching and recording whale sightings. Eagles. Ravens. Seals and sea lions. Clouds that are never the same twice. The wind. Even the rain. Challenging my mind and body to perform. Time to think and write and create. Living deliberately, as Thoreau would say. And especially those times when I do get to sip hot tea by the sea. This is fascinating, Wendy. I had no idea how physical the job is, and impressed that you took it on! Yes, it was quite the experience for me. I learned so much in a short time. Ghost Light – how intriguing! Wow! That’s a lot of work, but generous peace of landscape. It sounds wonderful.